Home VgamerZ OpinionZ How Scary Is… ‘Resident Evil 4‘? How Scary Is… ‘Resident Evil 4‘? 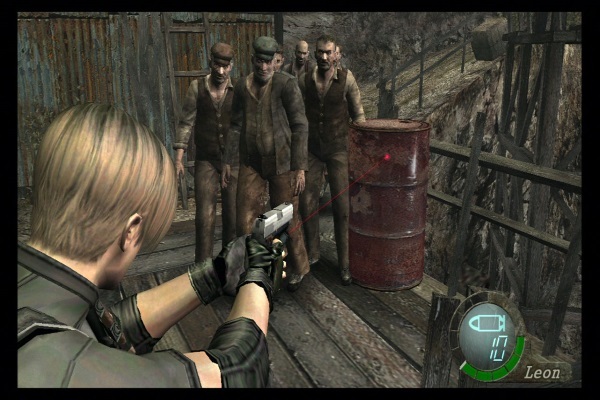 Resident Evil 4 was the game that brought a paradigm shift to the franchise. As such, it’s an odd case that is as celebrated as it is scorned (and if anybody does scorn, it’s the nerdsassins of the Internet). Over the course of the original trilogy, we got a cast-iron sense of what Resident Evil is. What is should be, shall be and darn well will be. Survival horror was to mean claustrophobia-tastic static camera angles and wonky movement/aiming. It was also to mean baffling puzzles with square-shaped cranks, which you’d have to backtrack for half an hour to find a use for. That was the genre, right there, and we loved it. Nemesis suddenly careening through a wall towards us and making us foul ourselves? We lived for that stuff. When the fourth game arrived, it completely obliterated all of those expectations. For better or worse, the horror/shooter/TPS/whatever-else-is-going-on-here genre was born. But the question is –the question you see right at the top of the page there– did it keep the spirit of Resident Evil alive in the process? The title began life in 2005, as a Gamecube exclusive. It’s the story of Leon Kennedy’s merry little jaunt to Europe, and the furious, murder-your-face-right-in-the-face cult he managed to irritate while there. His objective was the rescue the president’s daughter, who was rumoured to have been sighted in the area. Naturally, from his first encounter with the locals, it was clear that something was very wrong here. There’s nary a zombie to be seen. Instead, your first foes are the Ganados, regular farmfolk infected by the Las Plagas parasite. This is essentially a one-way ticket to homicidal crazy town. They still maintain some semblance of human intelligence, and you’ll find yourself besieged in a house very early in the adventure. The Ganados will plan among themselves, smash down your barricades and raise ladders to the upper windows. One particularly hung-ho gentleman brings along his chainsaw to attack you with. It’s all rather dramatic. Suffice it to say that these are a world away from the shambling undead of yore. Enemies are agile, tenacious and well-equipped (once you reach the island at the end of the game, they’ll have rocket launchers and miniguns), and there are many horrifying scenarios to overcome. But how does this translate into survival horror? There are certainly some scary situations. The barn siege with Luis, the ambush by the Bella Sisters and the Regenerator/Iron Maiden business is a shocker for sure. There are also charming little Resident Evil touches sprinkled throughout, NPCs who have recently suffered grisly deaths and such. 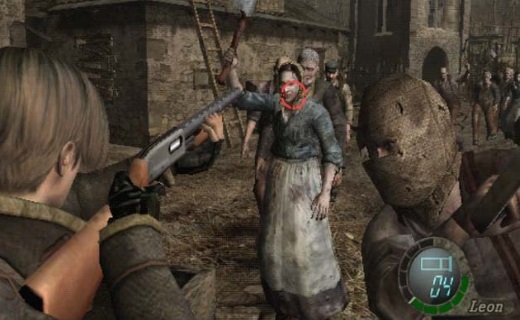 Resident Evil 4‘s issue is that it’s a great game, but not a great Resident Evil game. It feels more like a spin-off, rooted in the franchise’s world but still very much its own entity. There are flashes, but it’s just not enough. It is also derided for its legacy, with the following two games taking further great leaps from survival horror ideals. Still, if you can look on it in these terms, it’s certainly worthy of its title as one of the best games we’ve seen in recent years.